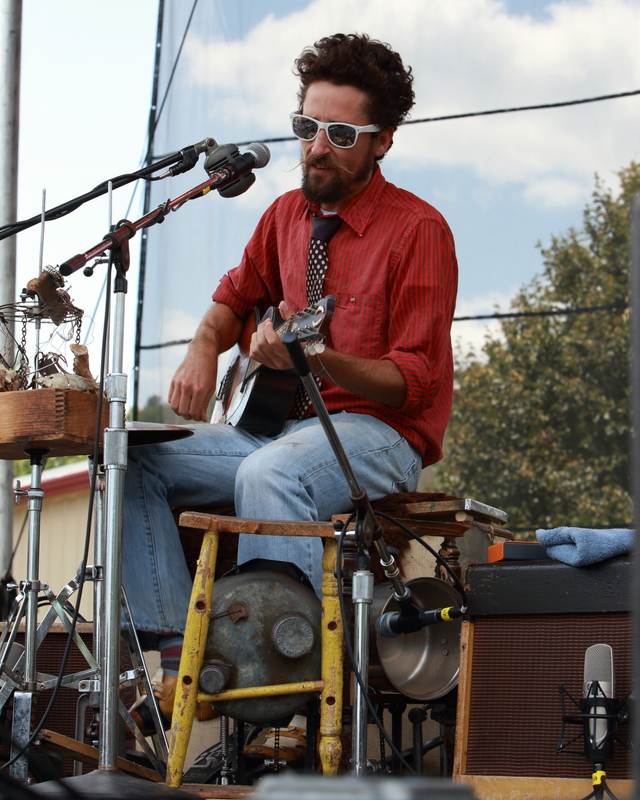 Opening the day on the main stage was The Suitcase Junket, a/k/a Matt Lorenz. 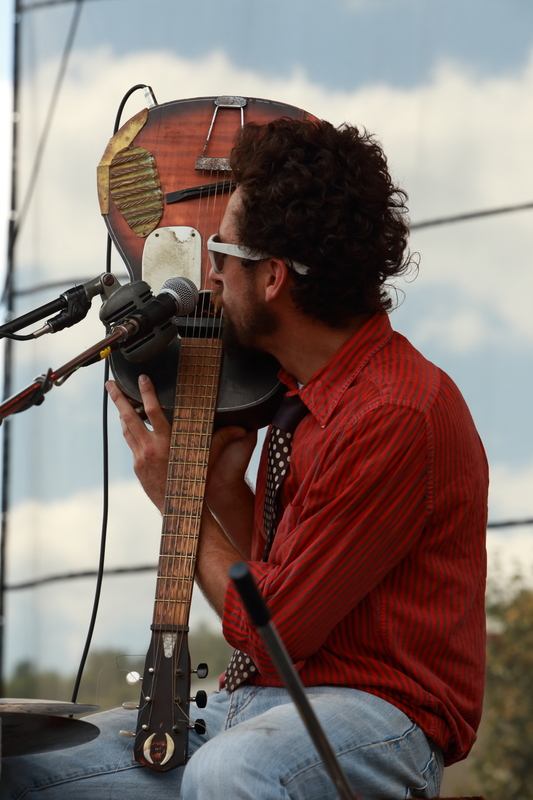 This is a unique act; Matt uses found objects – a baby shoe, pots, pans, a suitcase, and more – to create music that sounds like a full band. He also hums (for lack of a better word) into the guitar. 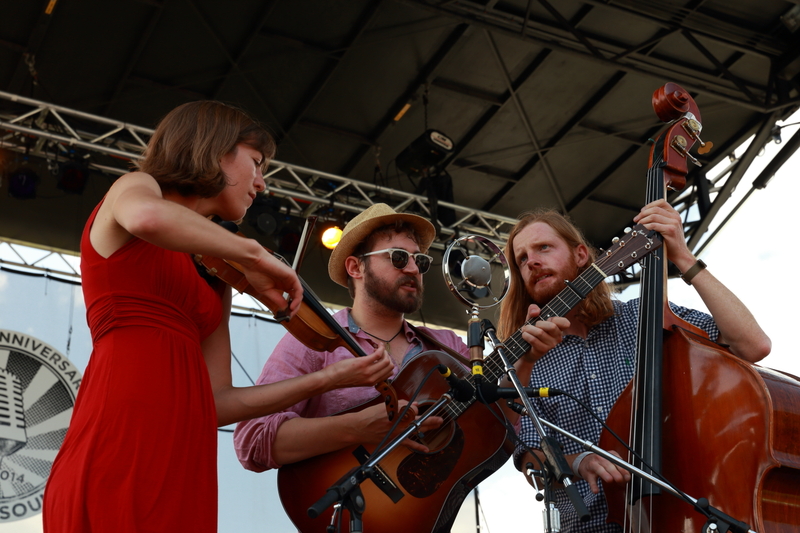 Next act on the main stage was The Stray Birds, a bluegrass-y band from Pennsylvania. 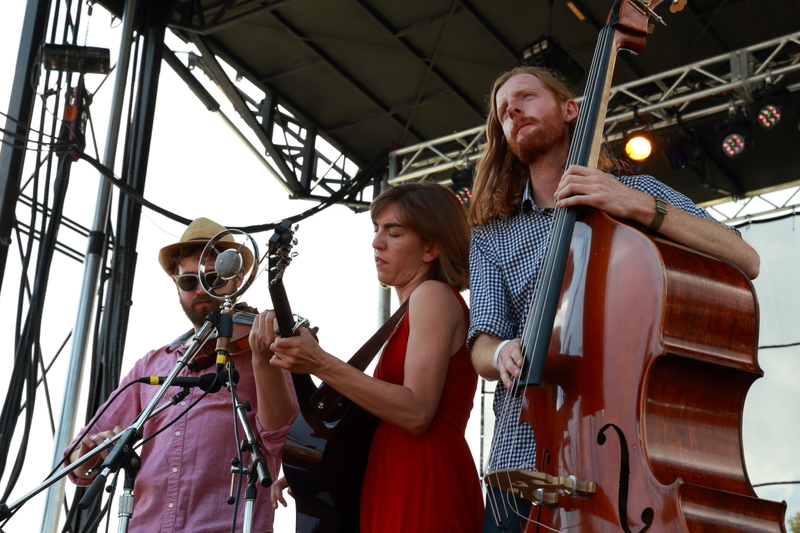 Maya de Vitry, Oliver Craven, and Charlie Muench comprise the band. This was my first time seeing The Stray Birds after hearing many positive opinions about them and I thoroughly enjoyed their set. Multi-instrumentalists, they play in front of a Grand Ole Opry style mic, slithering around one another to create a visually interesting performance (in addition to the terrific music). 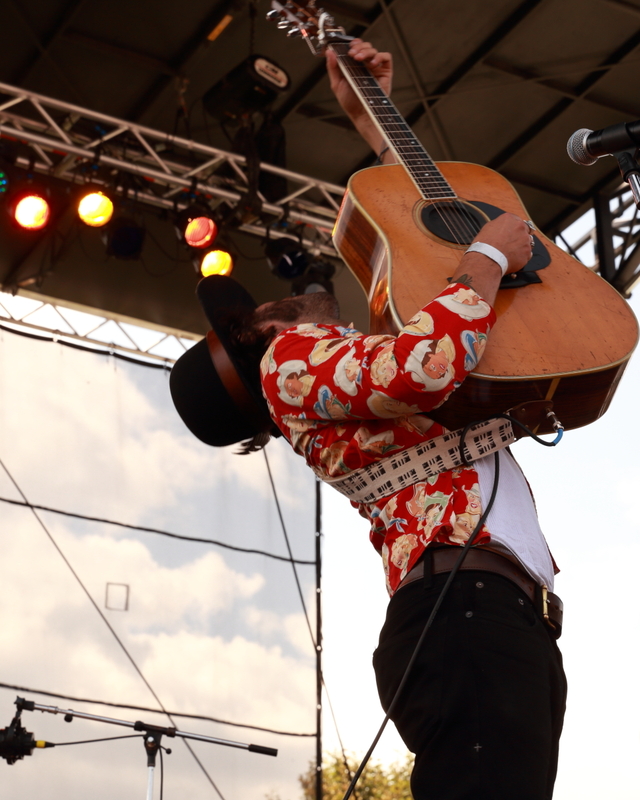 Langhorne Slim and the Law, another band from Pennsylvania, followed on the main stage; I was eagerly anticipating my first time seeing them and my patience was rewarded with a fantastic set. 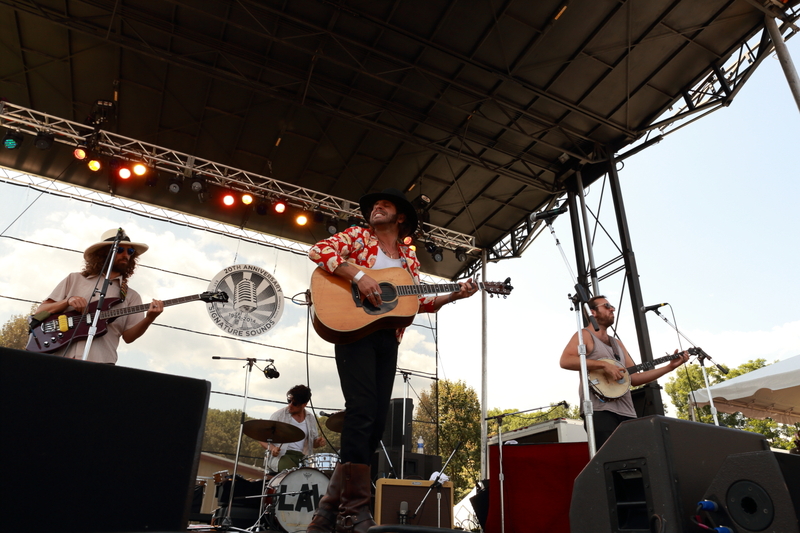 Langhorne Slim on vocals and guitar, Malachi DeLorenzo on drums, Jeff Ratner on bass, and David Moore on keys and banjo comprise the band. 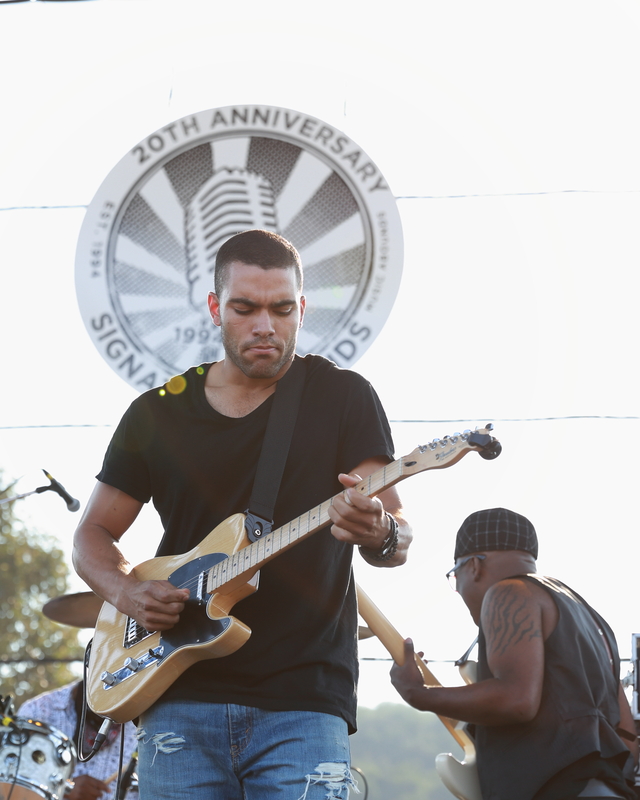 Slim clearly loves to perform; he interacted with the audience, hopping off the stage to go into the crowd and play. 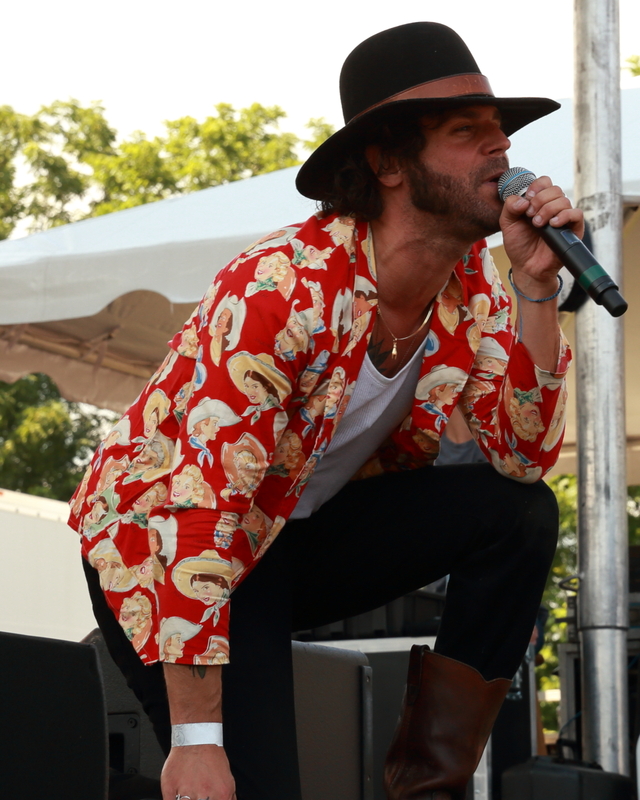 I was unable to see him from the photo pit, but the crowd was jumping up and down to the beat. They describe the band as folk/soul/rock, and that works. 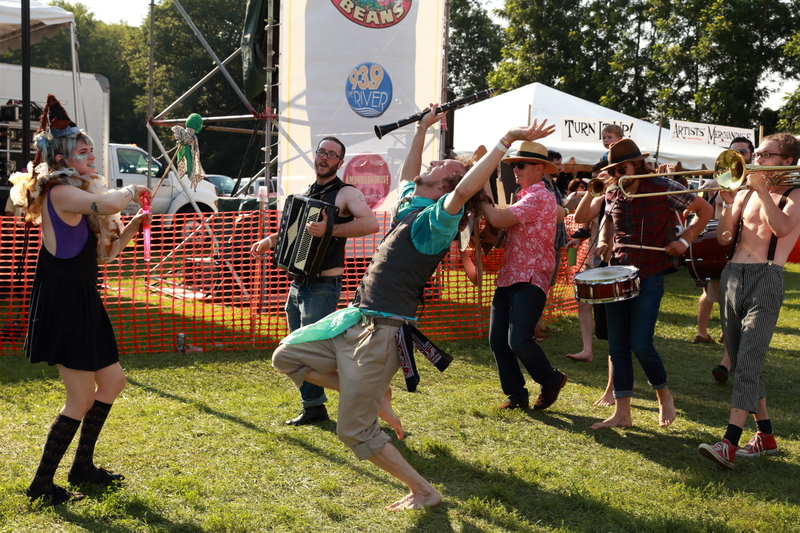 I think I would merely call it fabulous roots music, and I look forward to seeing more of this band next weekend in Newport! 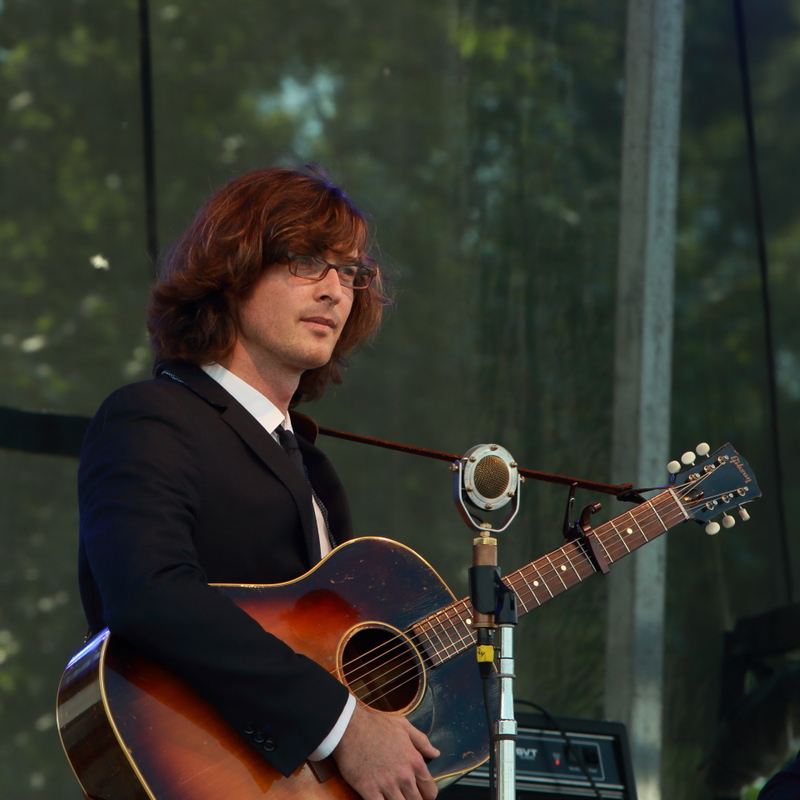 After this set, I meandered down the hill to the second stage to see The Milk Carton Kids, who I have seen several times but not since they released their most recent album, Monterey. 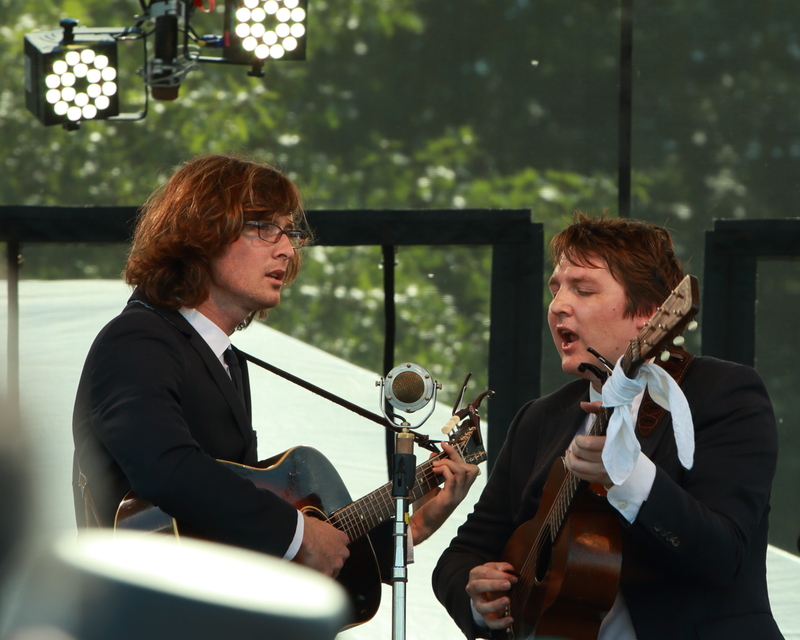 Joey Ryan and Ken Pattengale comprise The Milk Carton Kids and they keep getting better. Their schtick remains the same, however; Joey delivers a sarcastic banter and Ken bears the brunt of Joey’s humor. They both wear dead-pan expressions, but every once in a while they come out of ‘character’ and laugh right along with the audience. I love what I heard of the new album; it felt livelier than their previous recordings but is equally as excellent. Back up the hill to the main stage I went, only to hear the sole set of the weekend I did not enjoy. 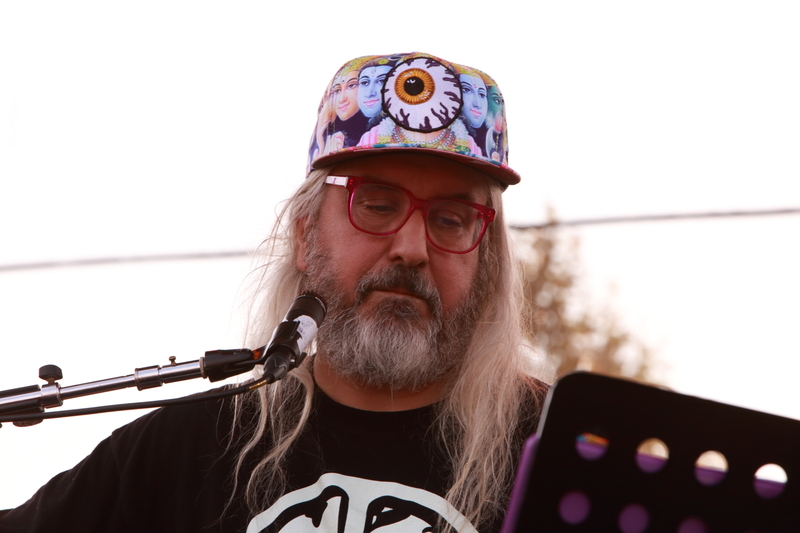 I understand J Mascis is a fixture in the area; he is a talented guitarist, but his music does not resonate with me. Others in the crowd liked his set, so I chalk this up to personal taste. 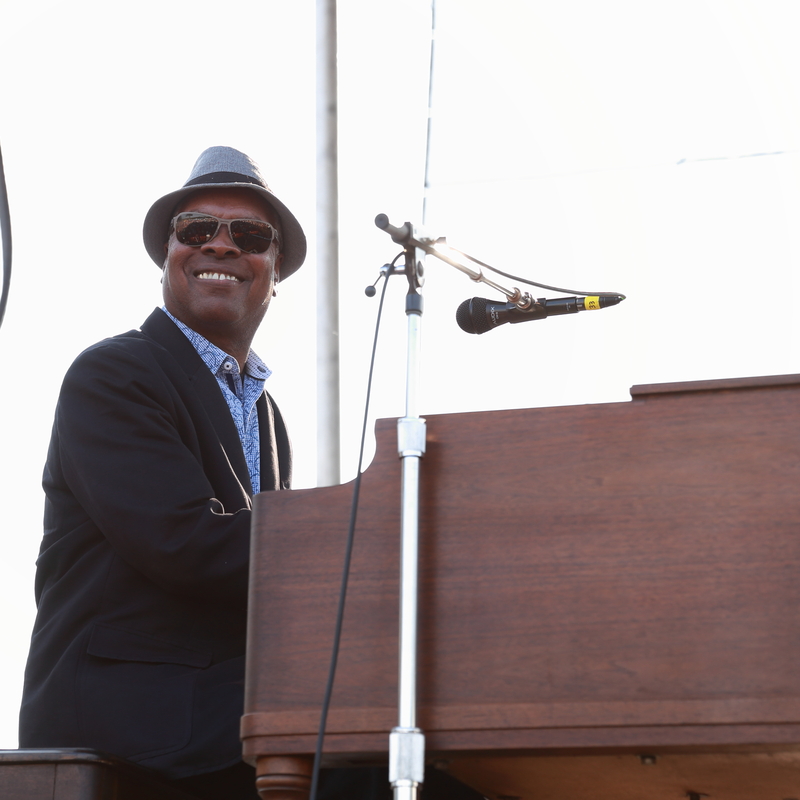 Next up was Booker T. Jones; despite having seen this band two nights before the Festival, I was really excited to see them again. 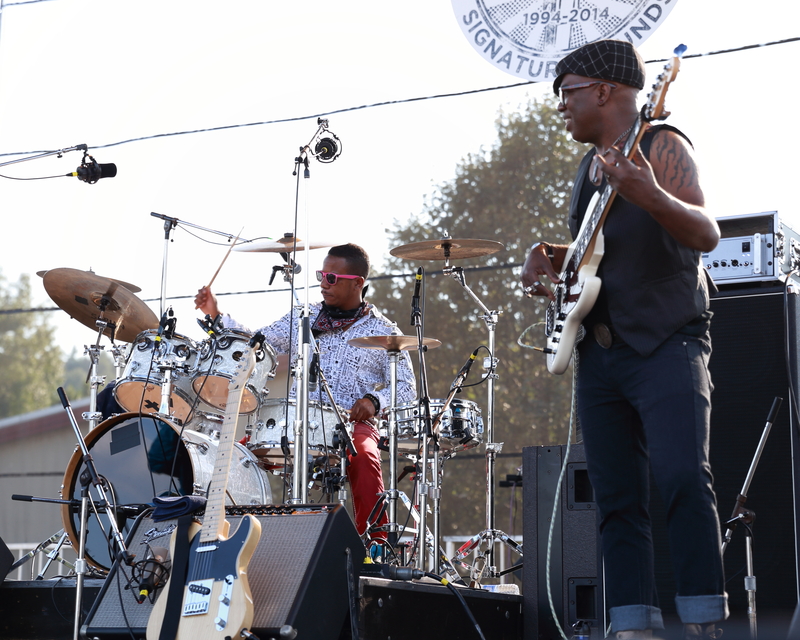 I had the opportunity to chat with the band earlier in the afternoon, and cannot imagine a more humble group. 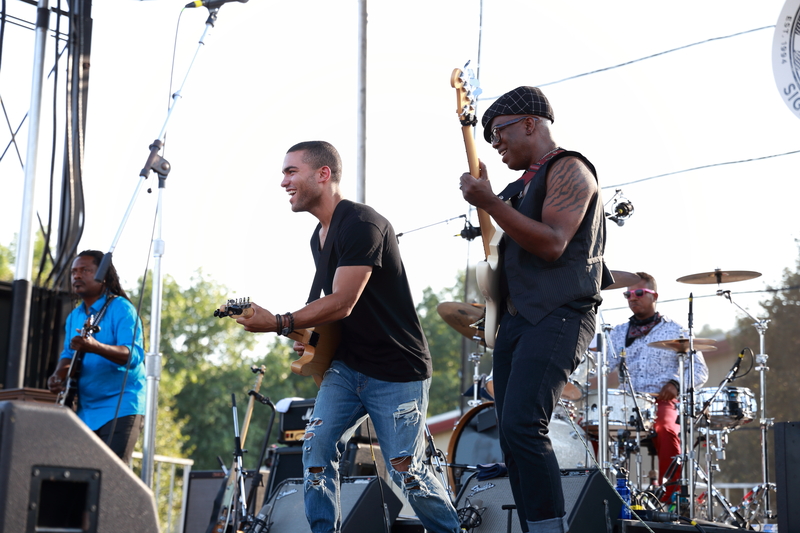 Composed of Vernon ‘Ice’ Black on guitar, Teddy Jones (Booker T’s son) on guitar, Darian Gray on drums, and Melvin Brannon, Jr. (a/k/a M-Cat Spoony) on bass, this band is incredibly tight. This was an incredible high-energy set that was, if possible, even more energetic than the longer set I previously saw. 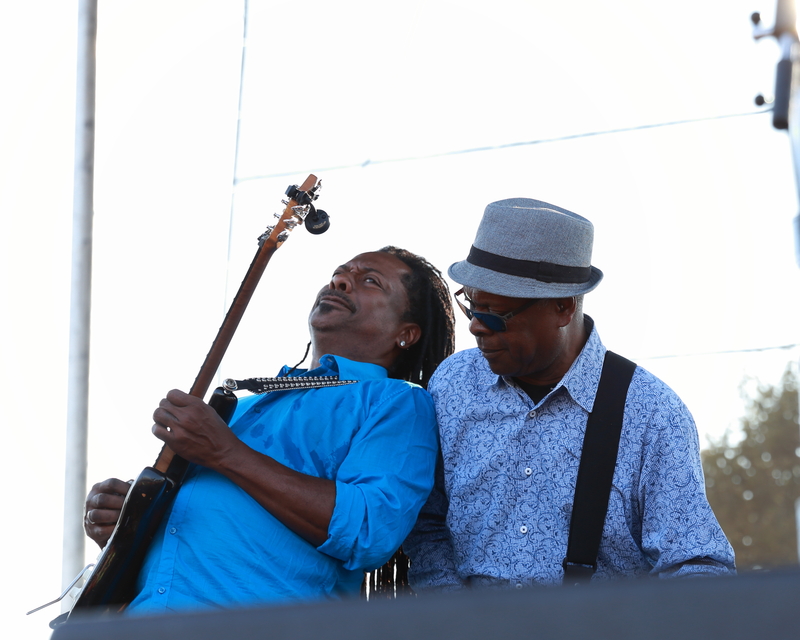 They performed the Booker T. and the MGs hits that you would expect – ‘Green Onions’ and ‘Time is Tight’ – as well as songs written by others with whom Booker T. shares a history. Prince’s ‘Purple Rain’ and George Harrison’s ‘Don’t Let Me Down’ are two of those songs. 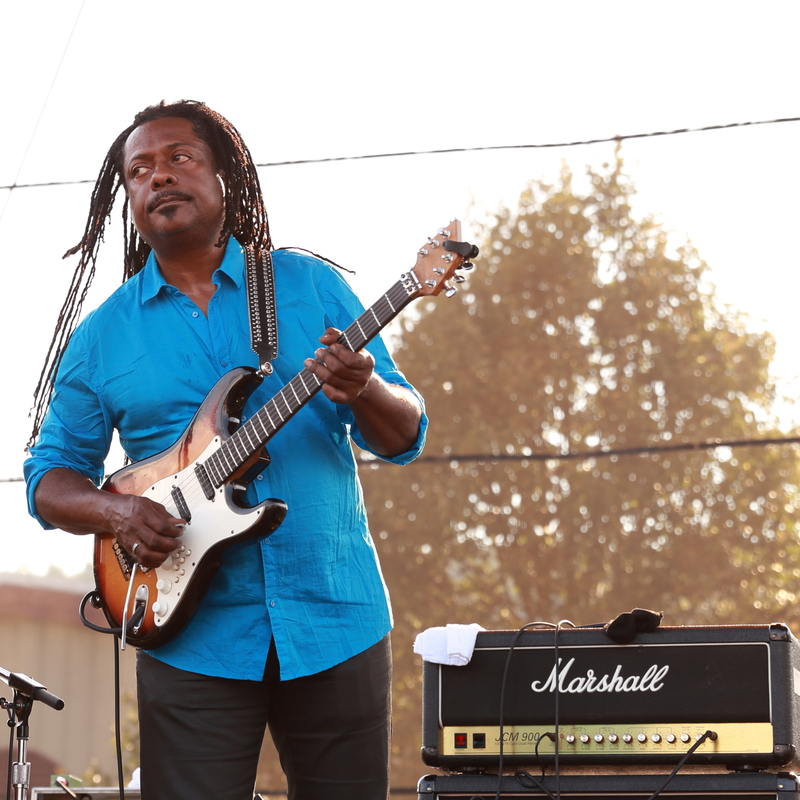 Booker T. shared a brief story as the intro to those songs which added to my enjoyment of his set. 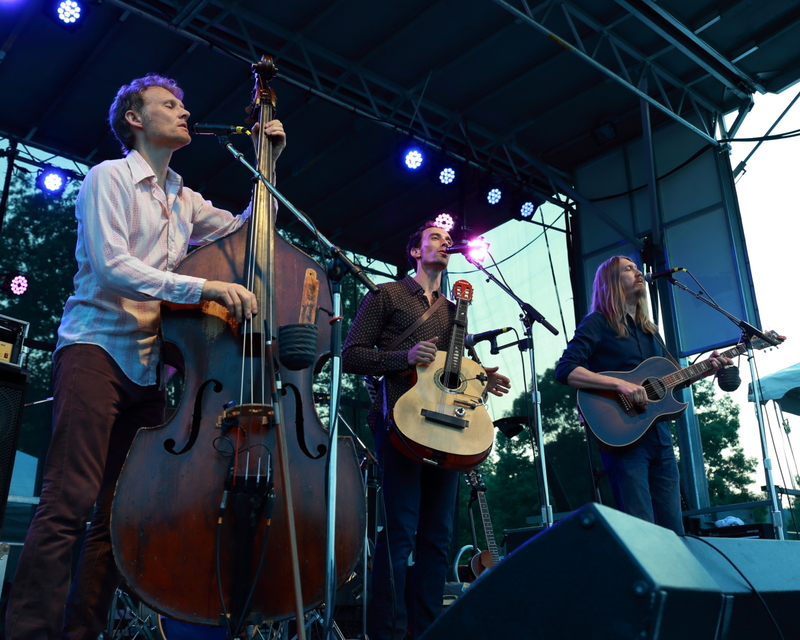 After a break to cool down after that hot set, I slipped down the hill again to see The Wood Brothers set on the second stage. I love this band and missed a local show two nights before (because I saw Booker T.), so I was especially excited to see this set. 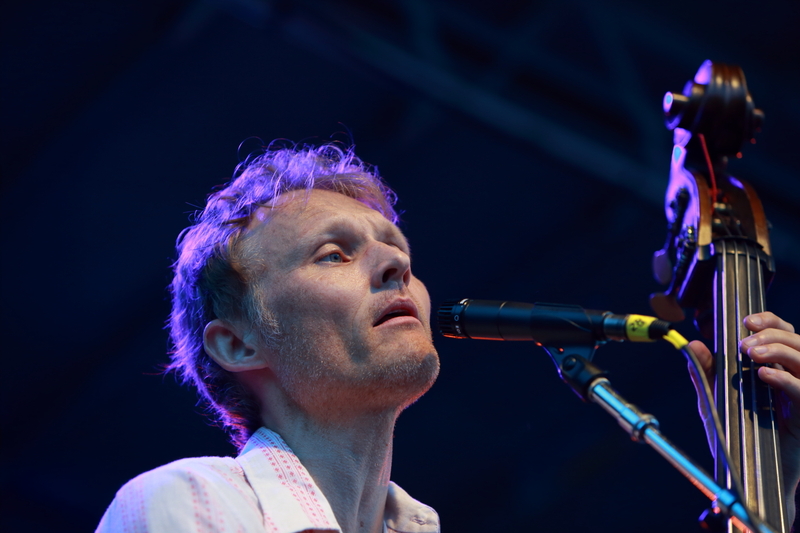 The band is composed of Oliver Wood on vocals and guitar, Chris Wood on vocals and bass, and Jano Rix on drums and shuitar. 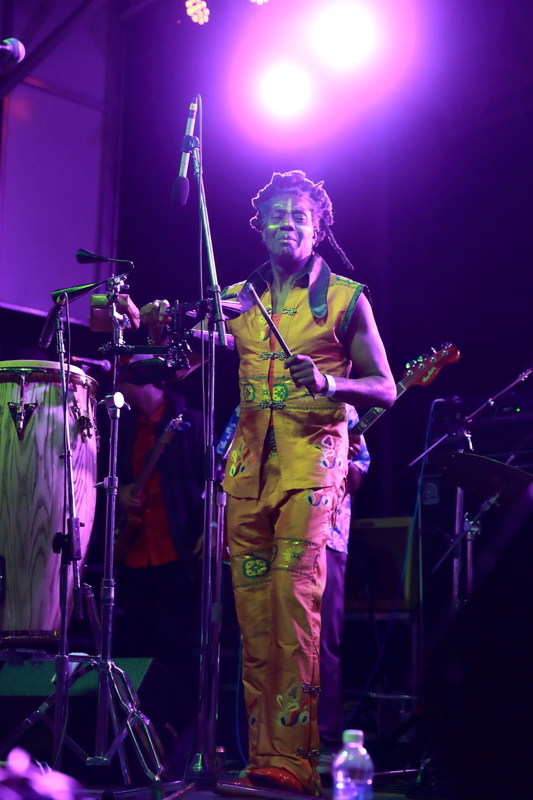 The last time I saw the band, I was too far away to see the shuitar – what an interesting percussion instrument! 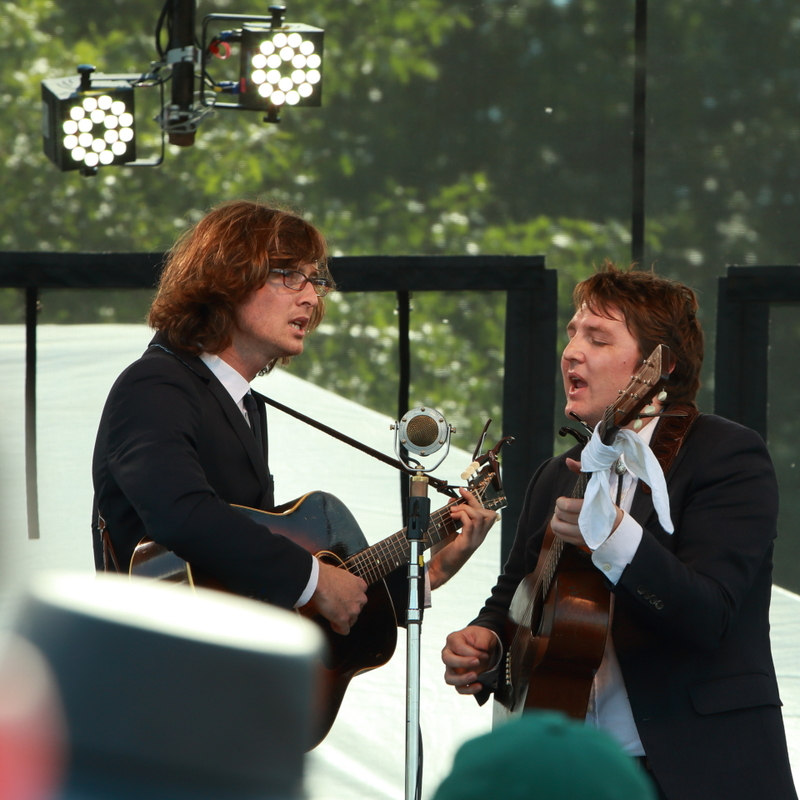 Their style of roots music is wonderful. 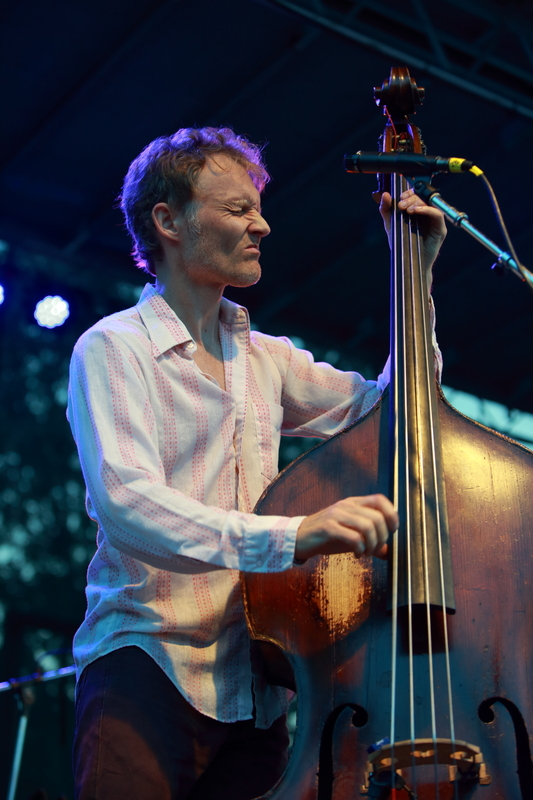 Chris (who is the Wood in Medeski Martin and Wood) is a master on the bass. He makes playing it look so easy. 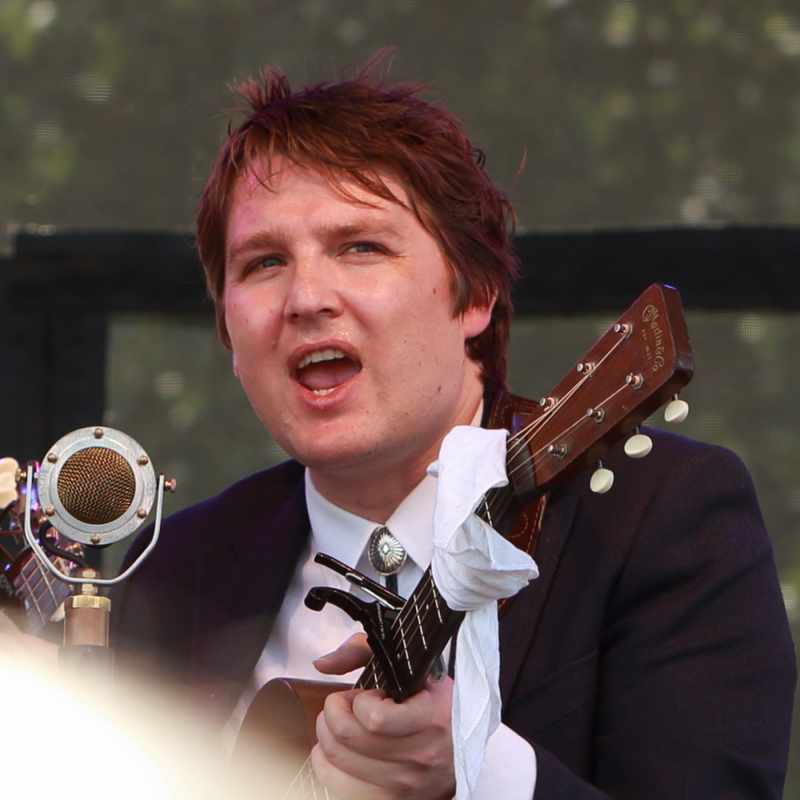 Oliver is a terrific guitarist and the primary songwriter (I believe). 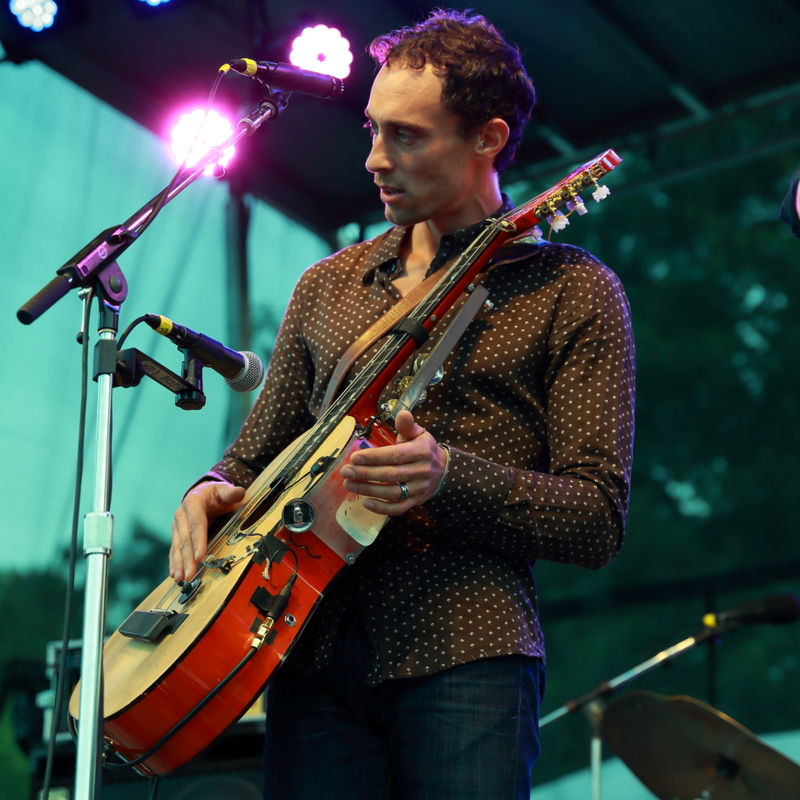 Jano is a multi-instrumentalist who sings backup as well. 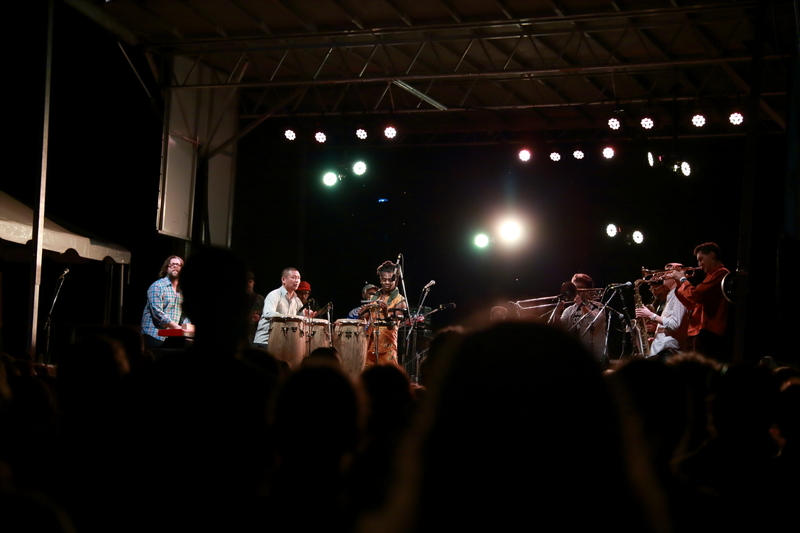 Last act of the day on the second stage was Antibalas, who I had also been looking forward to seeing. 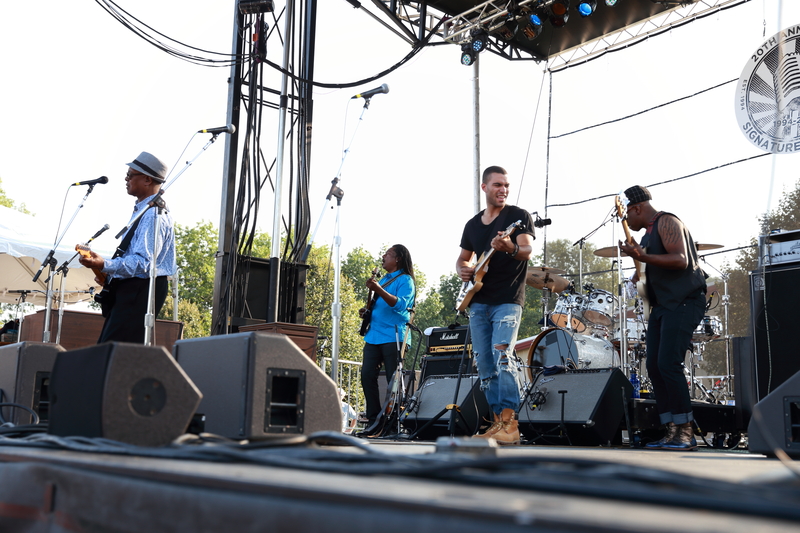 Based on Brooklyn, the very large band plays funk and Afro-pop music. As I recall, there were eleven or twelve musicians on this small stage which made good photography difficult. 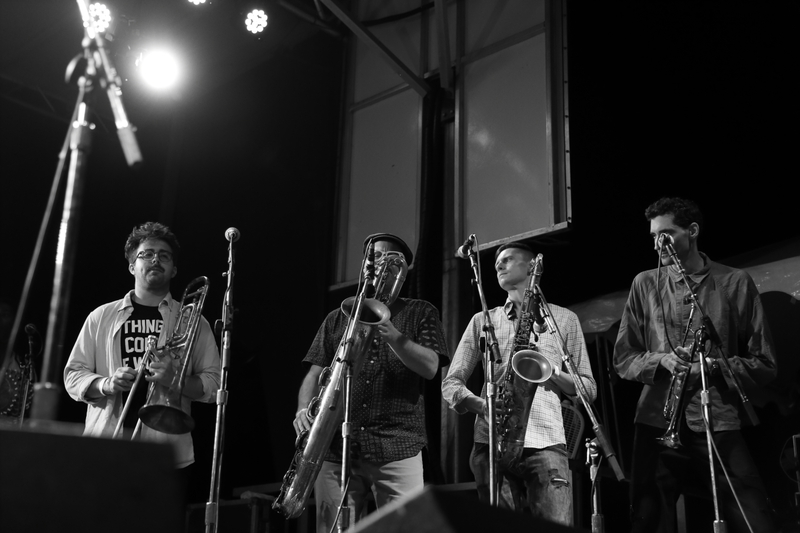 The current touring band is listed as consisting of: Amayo (Vocals & Percussion), Martín Perna (Baritone Sax, founder), Marcus Farrar (Shekere), Marcos Garcia (Guitar), Reinaldo DeJesus (Conga), Will Rast (Organ / Electric piano), Nikhil P. Yerawadekar (Guitar/bass), Timothy Allen (Guitar), Kevin Raczka (Drums), Raymond Mason (Trombone), Eric Biondo (Trumpet), Joseph Woullard (Tenor Sax), and Raja Kassis (Guitar). I stayed to listen to the first half hour of their set which I loved, and would like to see them again when I am not wiped out from the heat! I caught the last couple of songs from Rubblebucket and was sorry that I missed the chance to photograph them (I was too far back in the crowd and there were a lot of balloons in front of the stage). I loved what I heard and saw from this quite visual band. 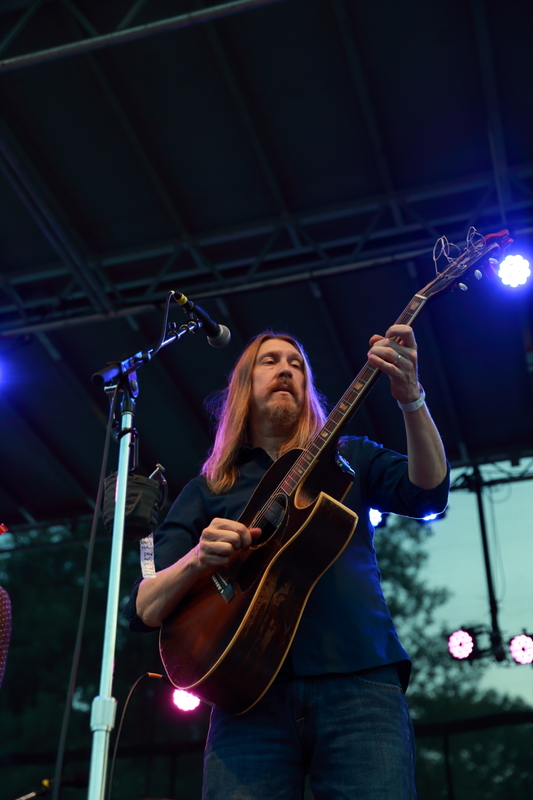 Apparently this was their fifth appearance at the Festival, more than any other act. 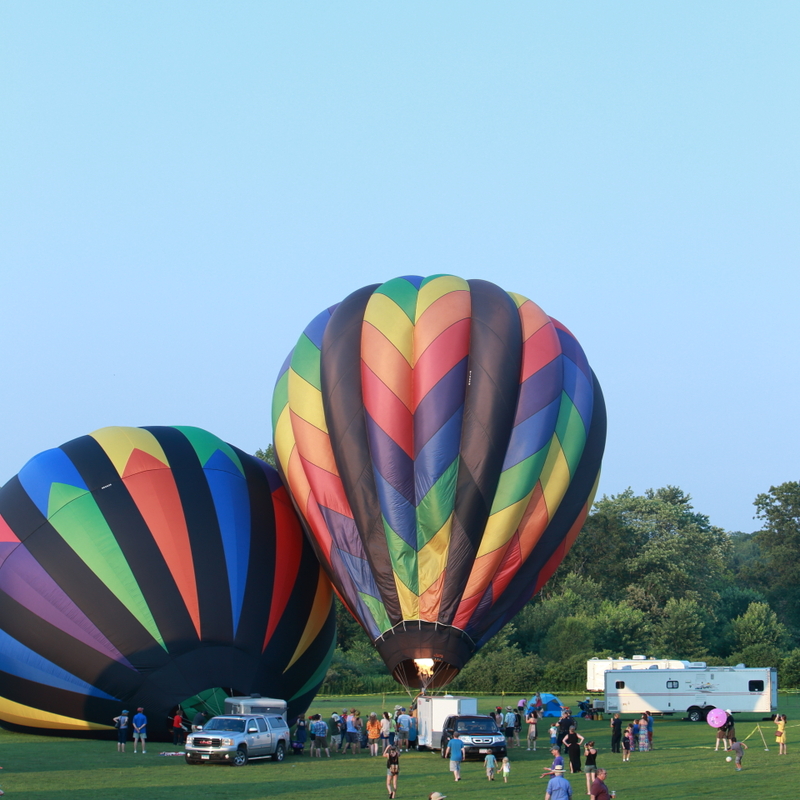 One of the highlights of Saturday at the Festival is the hot air balloons. 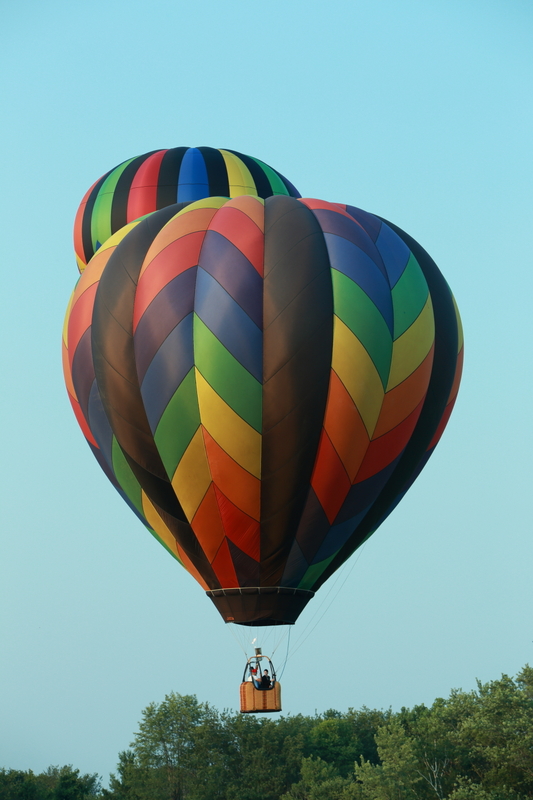 Brilliantly colorful, I enjoyed hearing the whoosh of the flames as they powered the balloons and watching them glide across the land. There was also a mid-afternoon parade which seemed to number at least one hundred participants. That was fun to watch, but the people in costume must have been really hot! 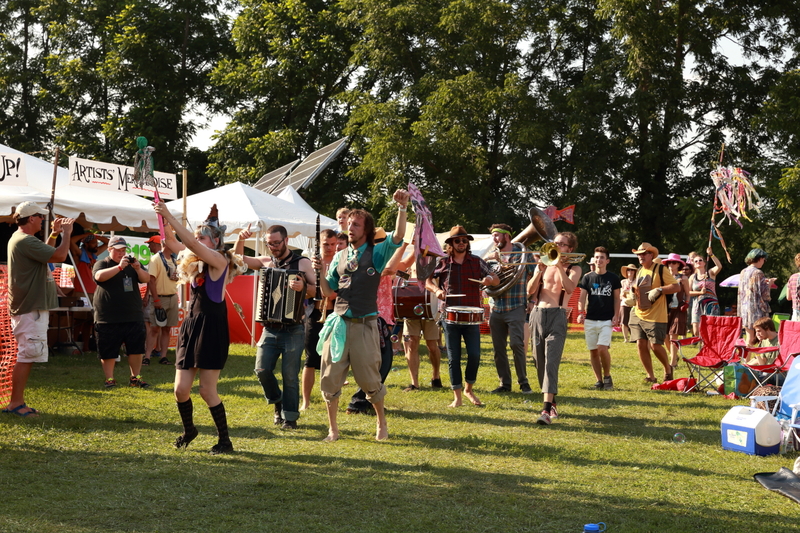 This was a day filled with amazing music, people watching, excellent festy food, and great craft vendors. I was glad I had another day of this! I am grateful to the Green River Festival for providing my ticket; all opinions are my own. 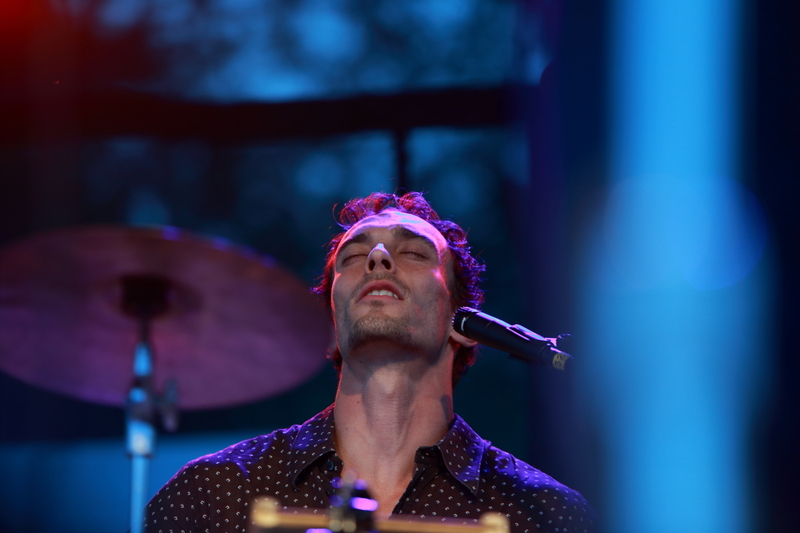 Posted on July 20, 2015, in concert photos, concert reviews, festival photos, festival review, music, Uncategorized and tagged Antibalas, Booker T. Jones, concert photos, concert review, Green River Festival, hot air balloons, J Mascis, Langhorne Slim and the Law, Massachusetts, Rubblebucket, Signature Sounds, The Stray Birds, The Suitcase Junket, The Wood Brothers. Bookmark the permalink. 2 Comments. Sounds like I’ll be going next year after your review and pictures. Heat is sometimes a challenge but the cold and rain same just flip side. Wood Brothers are my new favorite obsession. 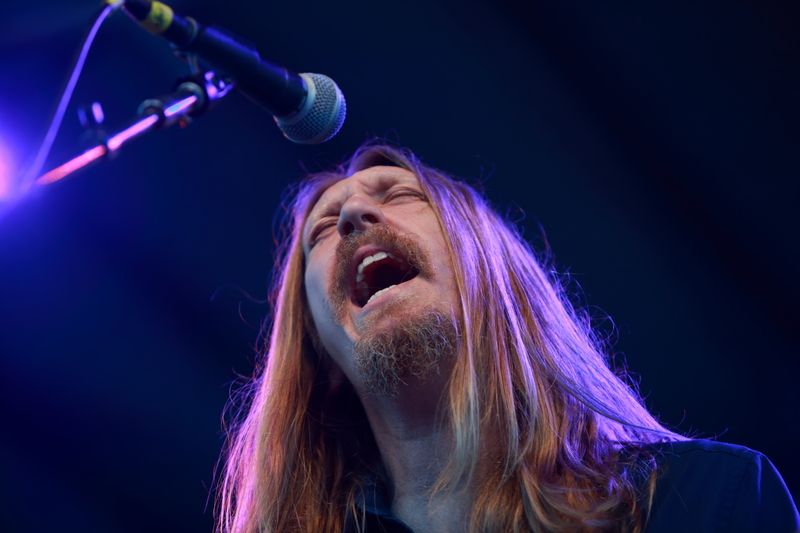 Thanks for the great photos – caught it all. 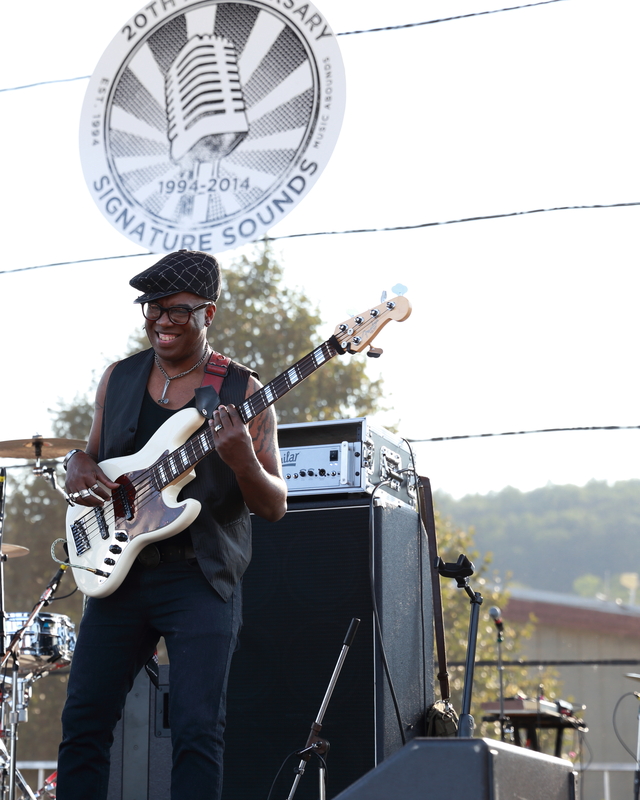 It’s a great festival and next year – the 30th anniversary – will be killer!